OxyContin is a prescription painkiller that has become increasingly popular as a recreational drug. It’s also known as “Oxy” on the street, and can be very dangerous. Its greatest use is the ability to minimize and control pain for up to twelve hours at a time. Its active ingredient is oxycodone, which is an opioid, similar to morphine, methadone, heroin, and fentanyl. OxyContin is used for treating moderate, severe, and chronic pain. The way it works is that its active ingredient – oxycodone changes the brain’s perception of pain and helps ease pain from an injury, an illness, or after surgery. Nonetheless, OxyContin also leads to a feeling of euphoria, which is why it’s often abused. OxyContin abuse affects more than just your physical health, but it also has a great impact on your social and work life, as well as your personal relationships. When you change the way you take OxyContin that’s when you start abusing it. When you’re taking OxyContin orally, its properties are released in a controlled manner. In this way, you relieve your pain without getting high, experiencing euphoria, or any side effects. OxyContin abuse occurs when it is crushed up, snorted or injected in the bloodstream. 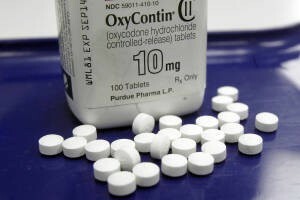 Another way to abuse OxyContin is to mix it with other substances, like alcohol, cocaine, or heroin, which lead to a better high. Extreme drowsiness, disorientation and confusion. Pinpoint pupils and a dry mouth. Lack of interest in physical and social activities, as well as in personal hygiene. Mood swings, and a bad, unpredictable temper. Neglecting all obligations, like: work, school, or home duties. Depression, insomnia and sleep apnea. If you notice some of the symptoms yourself, make sure to speak to a doctor, or a professional, and stop OxyContin abuse from negatively affecting your life. The symptoms of OxyContin Addiction can vary from one person to another. They usually depend on how long the addiction lasts, and how frequently or how much the individual uses. continuing to use it consciously knowing the negative effect it has on your health, and your social or work life. While you may think that the physical signs are easiest to detect, sometimes it’s the small and subtle changes in mood and behavior that actually make you see that your friend or loved one needs help getting over an OxyContin addiction. Executive rehab programs also include similar amenities, but they also provide additional support to people with busy professional lives, that need to continue with their work, while enrolled in the program. Traditional rehab programs offer the same support and treatment, but do not have the luxurious, high-end facilities, or some extra amenities. They provide the same results as the others, but are way more affordable.